It is never a surprise to find the remains of burials in London! The size of the city and its long history mean that you are never very far away from a burial ground, whether it be Roman or later. One could say that much of central London was a traditional burial site! Museum of London Archaeology and Crossrail’s archaeologists have been working for a decade to predict the likely archaeological remains in the areas of the works, and how to deal with them in advance of construction. However, whilst we knew that we would encounter burials from the 16th-century Bedlam burial ground, it was not at all certain whether Roman graves would turn up. Although known from past finds in this part of London, the sheer number of skulls we have found, currently more than two dozen, has indeed surprised us. Have these finds changed, modified, or shaded-in previously held perceptions of life in London in Roman times, or of the ancient geography of the city? These finds are very important, as they help us to characterize the nature and use of one of London’s “lost” rivers, the Walbrook. At this very early stage, we are not sure whether the finds will change or modify our perceptions of life in Roman London. What we do know is that they will help us to fill in another gap in the Roman map of the city, allowing us to fill out the information we already have. Each archaeological investigation helps us to join the dots and fill gaps in our knowledge. How important was the River Walbrook to London in Roman and medieval times? The Walbrook formed a useful water supply, not only for daily life, but also for industry such as tanneries on the edge of the medieval city. However, the many branches of the stream may have been as much of a hindrance as a benefit to the Romans, who expended much effort to force the watercourses within the city of Londinium into channels revetted with timber, and [who dumped] large quantities of earth to reclaim adjacent ground for building. Image Carl Turner Architects / The Edible Bus Stop Our team will be investigating the South Bank of the Thames between Battersea Park and Vauxhall Bridge. We are looking for opportunities on the ground to up-scale the idea of guerrilla gardening and hopefully make a new green route between these two landmarks. The green will be about growing food and we will see what connections can be made with local communities to support these new public spaces. Our aim is to creative active public space, managed by local communities. We would also like to see if its possible to stitch back the residential areas North of Nine Elms with the river. Industry and transport have created a huge disconnect between people and this part of the river. River Rooms 2113 -a necklace of public spaces to grace the Thames / David Kohn Architects River Rooms 2113. Image David Kohn Architects Londons future growth depends on creating vibrant public spaces that are accessible to all, well-connected by transport, surrounded by excellent housing and amenities at appropriate densities. Where will these opportunities co-exist in the coming century? River Rooms 2113 is a proposal for a necklace of public rooms at the scale of the city at existing and proposed River Boat piers along the Thames. The Mayor of Londons 2013 River Action Plan seeks to increase passenger journeys from 6 to 12 million a year by 2020 which could continue to rise, becoming a preferred choice of Londoners and tourists. 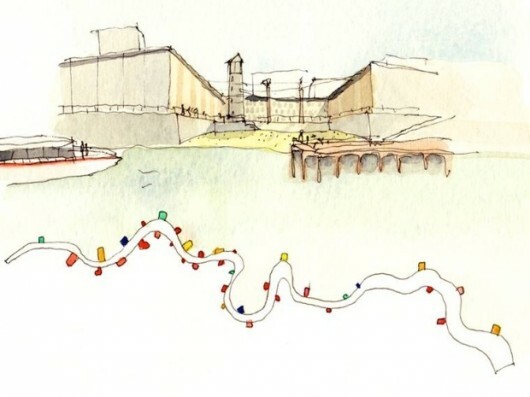 By 2113, River Rooms could present a new way of understanding London whilst reconnecting local communities to their river frontage. FloodPlain. Image Neil Cummings / 51% Studios #floodplain is an online platform that enables users to make collaborative, spatial representations of London, its main river artery, the Thames, and their floodplains. Using vast pools of openaccess public data the #floodplain site re-imagines the tidal Thames for the 21stcentury, suggesting new ways to map, imagine, and inhabit London, its sites and their architectures. #floodplain is a new kind of public space, that will enable users to become architects of their own environment. Lubricity / The Eastern Reach Lubricity.